Imperial Avenue ... 45-storey luxury tower. 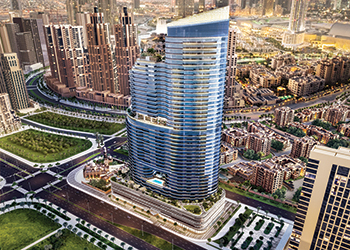 Having served the Middle East as contractors for over four decades, Shapoorji Pallonji, one of India’s oldest business conglomerates, has entered the region as property developers with the launch of Imperial Avenue in Dubai, UAE. Construction work has already started with shoring and piling on the project, which is expected to be completed by Q3 2019. Imperial Avenue is the first real estate project by Shapoorji Pallonji (SP) outside India, says Jacob Joby, director – development at SP International Property Developers. An exclusive collection of luxury homes, each in a class of its own, Imperial Avenue offers a chance to reside at the pinnacle of elegance in one of the world’s most celebrated neighbourhoods, Downtown Dubai, and near the Burj Khalifa. “From its fluid design and sophisticated features to its unsurpassed amenities and prestigious location, it is a true jewel in our crown. And to live up to its promise of architectural brilliance, it is designed with three levels of charmingly landscaped, free-flowing podiums with state-of-the-art facilities,” says Joby. Standing 45 storeys tall with 424 stunning apartments and five levels of parking, Imperial Avenue emphasises on larger living spaces. It sits on a 96,000-sq-ft site and offers a total built-up area of 1.4 million sq ft with 21,000 sq ft of retail space. The development features one- to four-bedroom apartments, four- and five-bedroom penthouses, three-bedroom villas and four- and five-bedroom villas with private pools at the podium level. “Imperial Avenue has a set of premium, luxury apartments from the 26th level onwards, which will offer a whole new level of extravagance from the already premium apartments at the lower levels,” he says. The company’s contracting division Shapoorji Pallonji Mideast is the main contractor and Arch Group is the consultant. Imperial Avenue ... work under way. Imperial Avenue will feature a massive 10,000-sq-ft entrance lobby and 13 high-speed elevators will serve the building. With a top speed of 4 m per second, residents can go from level 0 to level 45 in approximately 44 seconds, non-stop. There are two infinity pools, one on the ninth floor for families and another on the 26th floor. Level six has an outdoor kids’ play area while an indoor kids’ play area is located on level nine. The sixth level also features a landscaped walking area. There is a recreation area, mini theatre, squash court and party hall on the 26th floor. Commenting on the outstanding features of the development, Joby says: “Solar panels will be installed for water heating on the roof, which will provide for a centrally heated water supply in individual apartments. This helps in maximising space and reduces the overall electricity and maintenance costs. “For the first time in a residential building in Dubai, greywater treatment plants will be installed as a sustainable source of water for landscaping, common areas, car wash and toilet cisterns. In addition, every apartment will have a drinking water purifier from Lux International, Switzerland, a leading brand in the European market – an amenity offered for the first time in residential apartments in Dubai, according to Joby. A highlight of the project is the ultramodern parallel opening windows, the latest in window design, fitted in every apartment to allow better ventilation and ease in usage. Another first is the 6D BIM, building information modelling process, a transformational technology that has been introduced for the first time in the Middle East, which helps bring down the maintenance cost substantially, he adds. Every apartment has an LPG connection in an attempt to move away from the electric cooking range and reduce costs. A smooth driveway, past a cascading water fountain, offers a dramatic entrance to Imperial Avenue. Upon entering the building, residents are met with stunning interiors and the relaxing sound of trickling water at the lavish lobby, which triples up as a meeting space, a space to socialise and a reading area. A private audio-video (AV) room and a private function hall are part of what the project has to offer. Residents can also engage in private movie screenings with comfortable seating and a private space to host casual gatherings. Shapoorji Pallonji was established in 1865 and has been associated with many landmark projects across the India and beyond. “We take great pride in having industry-leading projects within our portfolio, including the tallest residential building in India, the largest mall in India, largest cement clinker plant in Asia, nuclear research establishments, airports, factories, stadiums and more. We are currently present in over 45 countries globally, including 20 countries across the Middle East and Africa (MEA),” says Joby. In Dubai, the company has been associated with projects including Nad Al Sheba bridge in Meydan, Golf Villas at Arabian Ranches, Park Towers for Damac, Taj Grandeur Residences (Palm Jumeirah), Rove Hotels for Emaar, Mudon Villas, and in Abu Dhabi Fairmont, Bab Al Bahr. 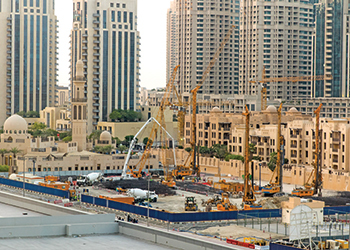 Its ongoing projects are Abraj Quartier, Qatar; Green Community Phase Three, Dubai; Riyadh Airport, King Abdullah Financial District, Saudi Electrical Company headquarters in Saudi Arabia; and Al Sabah Hospital and Kuwait University in Kuwait. “SP International has stepped into the Middle East to establish itself in the real estate market internationally. We specialise in luxury residential projects, and this will be the focus for us in the coming years,” Joby says.